Thanks so much, Brian. I will see how far I can go with it first and then if further help is required, I will get back to you. I appreciate all of your help. I have sent you off an email, however, looking for potential assistance for another project. Once again - many thanks!! Is there a way to change the coding on the My Schedule page so that it renders the entire year's schedule rather than a single term? There is not, the PowerSchool tag is taken from the admin page and it doesn't seem to listen to the Default Parent Term setting. I modified the guardian/studentsched.html for our server to display full year. It's based on the admin-side Schedule List page. I've posted it to the downloads above as "FullYearSched.zip"... It's a LIST view, that's the tradeoff, not as "pretty". - Roger Sprik. off customizations, I can log in; what do I need to do to fix this? We have the same problem, but I can upload the new version. I need to delete the file that aren't compatibles and then upload. Is that correct? I just updated to EPP V3.3 and on the admin side under Custom Screens there are two Parent Demographic Change links on the left menu. How do I get that back to one? Look under admin\students\studentpages. You should see 2 pages. One is not the correct one and will need to be deleted. After that run the "Rebuild Custom Page lInks" under Special Operations. I had a file called parentdemochange.html.bak I removed it and only have one showing up again. I can not figure this out. I have the parent demographic update unchecked on the school and district parent portal setting pages. I still do not see it when I log in as a parent. Do you have a suggestion as to what I might check? I have this issue, as well as with the honor roll. I'll look into the honor roll issue. Does it work if you move to another screen besides the home? This is explained in the documentation. I have installed and enabled the EPP 4.0.4 (never installed the whole plugin before) and the Demographics Update won't show in the more2 UNLESS I manually set the enabledemoupdate field via Student Field Value. I assume if we want to use this function, we need to do a mass update of this field for all students? I couldn't see anything in the EPP_Guide that says how to update this field. We recently installed the Enhanced Parent Portal. Since that time - and I don't know if this is related to this installation or not, but we have a "string key was not found" under grading, etc. - this is now replacing the tab with our comments for the school was located. Our comments are all there - the only thing that has happened, is that the name of this tab is now called string key was not found. After speaking to Pearson, they advised that it was a result of a recent change to a custom page - have you heard of this happening with this package at all? Thanks for any guidance you can provide. Make sure you are on the newest version of PowerSchool which is currently 7.1.3 as of 4/9/2012. The pages are based off the newest version of PowerSchool and using them on a older version of PS will cause the error you are seeing where Pearson has changed the text tags in later versions. Thank you for this - we are on version 7.0.0 and have not upgraded to the newer version yet. We will be doing this over the next week or so. Once again - you have saved the day. Many thanks. Is there a way to fix this until we do our upgrade? The parent portal setup guide attached with this looks great! Thank you for the helpful information. After upgrading to PS 7, we installed the Enhanced Parent Portal. This is good work. Thank you for efforts on this. Good Morning - looking at the demographic change on the EPP, it is only available for some students and not others. I have checked under district settings, school settings to ensure that these are set correctly. Has anyone else had this happening? We did upgrade from 7.0 to 7.1.3 this past weekend - would this have affected the settings at all? Demo Update is enabled at the student level as indicated by the EPP Instructions. AHhhhhh - so right. Thank you! I am using bits an pieces of this, I put in the code to store the last update on a page and it is not filling in the parent name. I am assuming this is set in a page I didn't add in? Can you tell me what is missing to get this to work? It's part of the FTL file. If the FTL file isn't installed then the #parentName won't work. Is there any way to store the username of the parent instead of firstname lastname of the parent who last submitted demographic changes? 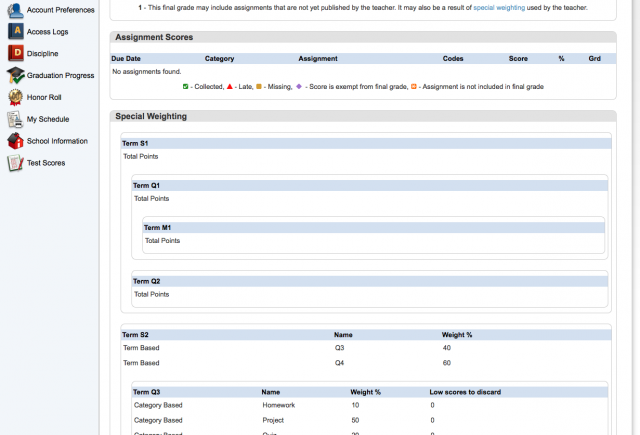 I understand that I can turn off the grade book feature by school, but is it possible to turn it off for specific grades within a school? Our curriculum director is considering opening the portal for our elementary schools but only wants grades/scores to show for grades 3-5. When I go to My Schedule in Parent Portal I get a 'file not found' error. Any idea what could be causing this? We went to PS 7.0 in December but I don't know if this was working at the time. I've just starting looking at Parent Portal. Thanks. I updated the parentdemo.html in the Guardian folder with information we wanted parents to be able to change. When I login as a parent I can see it. When I login to Admin and go to student pages, I see the original page without my edits. Do I need to match the parentdemo.html with the parentdemochange.html file and put that in the Admin>StudentPages folder? So basically add in all my new rows and fields to both .html pages. Yes you'll need to update the Admin page as well, but you can't simply copy the guardian changes and add them to the admin page because the approve buttons would do anything. You'll need to add the fields following the format that the admin page uses. Almost there and this is going to be great for us once I get this working. After customizations, on the parent side, it looks good and they can submit. On the admin side I see some of the fields, Approve button works and it submits. For some fields I cannot see what the parent entered (I used my student as a test). I have copied the code exactly as it looks for the fields that work, just changed the field names. Is there something else I need to do or have I erased something needed by copying and editing? Is there a page it submits to before I see it on the Admin side? Did you follow the layout of the input's existing parent demo file from the admin side? After I posted my comment I decided to delete what I had done and start from scratch. The layout was the issue. Even though the fields looked correct, the order of things and exact layout was changed. It works! Thank you so much. I have updated the Portal side with the fields that I'd like Parents to have access to change. I will do the Admin side next. But what I noticed is that when a change is made on the Portal side now, without the update to the Admin pages, the updated information goes directly into the database. Once I update the Admin side, will that force all data to "stop" and allow me to approve it first? Or have I messed something up? After updating my test server to 7.2.0.1 and logging into parent portal, ALL screens are listed in left menu, regardless of parent portal settings in admin. Also, once you click on any screen in the parent portal, you get a bunch of code at the bottom of the left-side menu. My district is running 7.2.0.1 and I just double checked and did not see the same issue. What version of PS are you coming from and have you made sure that you are running the newest version of EPP? Will I be able to hide the Class Registration page for specific schools? Wasn't sure about that one since it is a stock page. You could turn off email in PowerSchool but that would effect all PS email functionality. I installed all the files from your zip file. There were 3 pages I had already customized so I just put my changes into your files - the admin/students/more2, wildcards/guardian_header, and the wildcards/guardian_header_yui files. When I log in as a parent I get the HTTP Status 500 exception report. I'm not sure where to start to fix it. Can you help? I should say we are on version 7.1.2. What happens if you don't modify the wildcards and just use the EPP ones? That would determine if it's a EPP issue or a issue with the changes you made. The pages work. We just started using BLImessaging Power Announcements and that's why I customized those pages. I'm not sure where I went wrong. I will keep trying. I added this statement to the guardian_header.txt between the email notification and teacher comments. Does this statement look OK? I added this statement to the guardian_header_yui.txt after the first ~[wc:commonscripts] and before the I wasn't sure where to add the following statement. You'll want to but the UL and the CSS code in the same location as the others. Thanks for you help. If you see what's wrong let me know. Just installed this using CPM. It is wonderful. The images for the new "icons" did not load when I imported. I went to CPM and uploaded each image separately but they are still not showing up. What could I be doing wrong? Any help would be much appreciated. When you imported them one by one did you upload them in the guardian folder? They should not be in the images folder.